Cook the cherries along with little sugar for 15 minutes, stirring every 5 minutes, to soften cherries and release juices. Juices should be thickening. Transfer cherries and juices to a blender and puree well, until as smooth as possible. Strain through a fine mesh sieve and discard solids. Place in a container, cover, and chill well before using. Prepare an ice bath by filling a large bowl about 1/3 of the way with ice and covering ice with cold water. Set aside. Place 1 1/2 tablespoons cold water in a small bowl. Sprinkle over gelatin and stir in. Set aside while gelatin blooms. In a small saucepan, stir together 2/3 cup roasted cherry purée with sugar. Place over medium heat and stir slowly but constantly as the mixture comes to a low, sluggish boil. Stir and cook for an additional 30 seconds. Remove from heat and set aside to cool for 1 minute. Add gelatin and whisk in until smooth. Strain cherry mixture through a fine mesh sieve into a large bowl. Place bowl over ice bath and stir constantly until the mixture has cooled and thickened. In chilled bowl of stand mixer (or other bowl), beat cream just to stiff peaks – again, be careful not to overheat. Fold into cherry mixture in three parts, continuing to fold just until the mousse is smooth and even in color. Pipe or spoon cherry mousse in the molds and set in the freezer for a few hours. Quickly sprinkle the gelatin into the water and whisk together until it starts to thicken. Let this mixture sit and bloom until it fully gels and hardens. Meanwhile, prepare the glaze base. Bring the water, sugar, and condensed milk to a gently simmer. Turn off the heat and stir the bloomed gelatin into the mixture. Pass this mixture through the sieve to remove any gelatin clumps. Pour the mixture over the chocolate until it dissolves. This should take about 5-10 minutes for all of the chocolate to fully melt. Use an immersion blender fully submerged into the liquid to avoid introducing any air bubbles. Blend this until the entire mixture is smooth and homogeneous. Blend the food dye into the mirror glaze. Allow the mirror glaze to cool to the target temperature, which is about 33°C. Make sure you stir periodically to prevent a film from forming on the top. 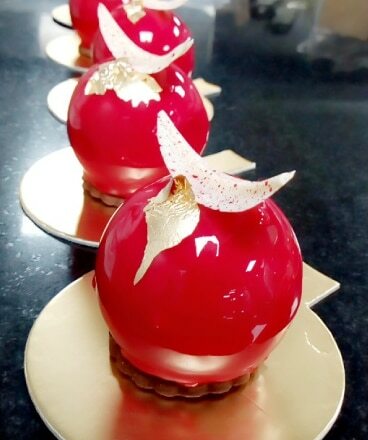 When the glaze is between 32°C – 34°C, it is ready to be poured over the frozen mousse. Wash the Urad Dal thoroughly and soak it in water for 1 hour. Heat 2 Cups of water in a kadhai. When the water starts to boil, add Salt in it. Reduce the flame and let the mixture boil for 10 minutes, stirring occasionally. In a large mixing bowl add Gram Flour), Red Chili Powder and asafoetida. Coarsely grind the Fennel Seeds, Cloves and Coriander Seeds and add it to the mixture. Add the dry mixture to the boiling water-lentil mixture and stir. When mixture get dry then Add oil and roast for 5 minutes. 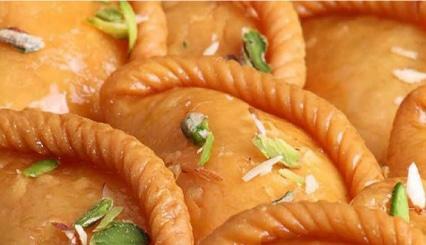 The filling for kachori is ready. Set it aside to cool. Add ghee into refined flour and salt and mix it well. Add water slowly and knead the flour and make a dough. Flatten out the dough with your hand to make a small disc keeping it slightly thick in the middle and slightly thinner on the sides. Place the ball of filling in the center of the disc. Brush some water with your fingers on the edges of the disc. Fold the edges on each other and seal the top. You can remove the extra dough from the top. Very gently shape the filled dough into round shape. 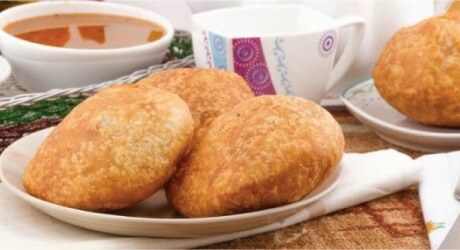 With a greased hand flatten the ball slightly into the shape of a kachori. Take a kadhai and fill it with oil and heat on medium flame. When the oil is medium hot, add 5-6 kachoris to the oil. Stir and flip the kachoris continuously. 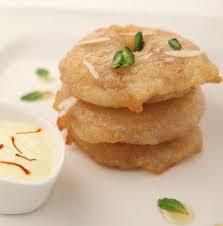 Urad Dal Kachori is ready. Serve it hot with Mint Chutney, Tamarind Chutney. In 1/2 cup Luke warm water.Dissolve yeast with 1/4 tsp sugar.Keep aside for 5 to 10 minutes. In a mixing bowl,add refined flour, corn flour,sugar, cardamom powder, salt and yeast. Add butter and more water add butter and more water make a thick batter. Keep aside for an hour covered.After an hour, mix well to get a smooth batter. Boil water and add sugar, saffron to it. Boil for 10 minutes. If syrup is thick, add 1tsp lemon juice. Slice the Apples into thin slices.Remove the seeds part and discard. Heat oil in kadai, put the flame to medium.Dip the sliced apple in the batter to coat it evenly everywhere.Carefully drop in the oil.pour the hot oil over while it gets cooked. Flip and cook other side too until crispy and golden. Soak it in warm sugar syrup.Let it soak until you add the next one. Flip the jalebi in the syrup between. 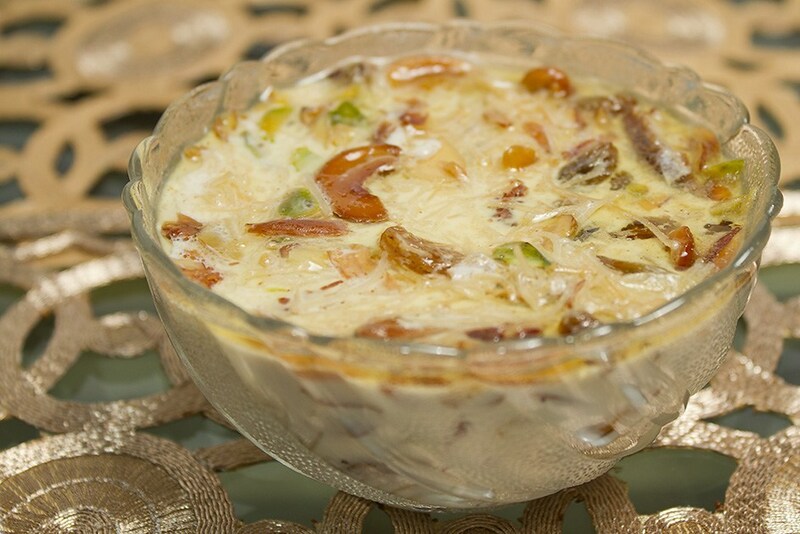 Garnish with pistachios or any dry fruits. Heat 2 tbs ghee and roast vermicelli till golden brown & set aside. Take milk & sugar in a sauce pan and cook til it comes to a boil and simmer for 10 minutes. Add semolina and cook till it is cooked.it will take around 15 minutes. Now take it or the heat and add in condensed milk , saffron , cardamom and mix well. Heat 2 tbs ghee and fry nuts till golden. Add it into the Kheer and mix well. Mix all the ingredients and serve on the basket and garnish with aloo bhujia and mint leave.